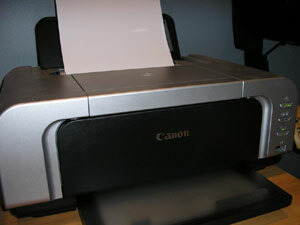 Canon are well known when it comes to printers, from high end corporate machines to printers for home use, such as the IP4200. This is a colour inkjet printer available for under $150 AUD and boasts multiple input trays, CD/DVD labelling and the ability to print direct from certain Canon cameras. What’s not in the box that should be? - A USB cable. Seriously, what the hell is Canon thinking, not supplying a USB cable with their printer? Fortunately it's just a standard USB 2.0 printer cable and can be had for $1 at a swap meet or the likes. The printer is fairly standard-looking in a silver/grey/charcoal colour scheme. I'm conservative, and I like this style - it would fit in quite well in most home offices. What are important are the dimensions, and this printer isn't particularly small at 150mm X 395mm X 300mm. Of course, this machine does fold out and grow in size. The paper tray is basically the size of an A4 piece of paper. It does the job, but it takes up heaps of space in doing so. Fortunately I discovered that the tray only needs to be extended half way and it will still function properly and catch the paper sufficiently. It even has a pop-up paper feeder on top, so you can do the traditional style of printing to eliminate folding the paper more than needed (in case of using quite thick paper such as papyrus). 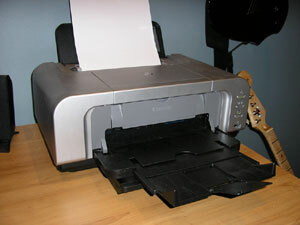 Unfortunately the printer will not function if the top paper feeder is not opened. 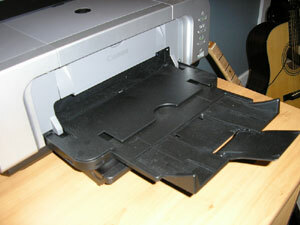 The other option is the tray loading paper feed, which is located on the bottom of the printer. 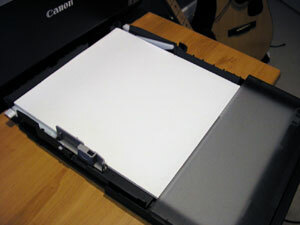 This is a slide out tray that can be adjusted to accept multiple sized papers. This is a wonderful feature, as if you run out of paper while printing from the top loading tray, it will automatically feed through the bottom. Also, you can use it to store different types of paper, for example cheaper paper for normal printing and gloss paper for photographs. 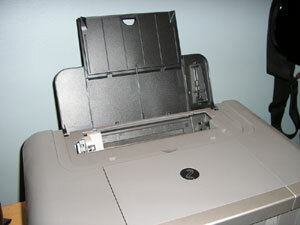 The only drama with the tray is that when feeding paper it has to do a complete 180° bend of the paper in order to print onto it, so thicker types of paper may result in a jammed printer. The printer again, fully opened, ready for some printing! 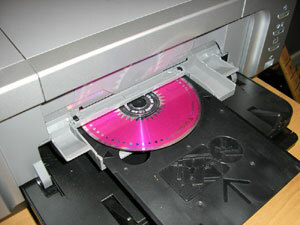 The printer prints on CD/DVD's and does a very good job of it! Unfortunately the CD tray is quite flimsy. Just be sure you don’t break it! One of the DVD's I printed. Looks pretty nice to me. 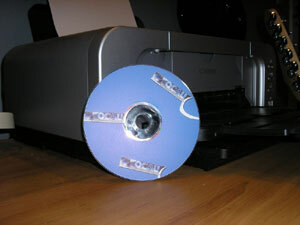 Just to put in perspective the size of the IP4200, I placed the CD up against the printer. Remember, a CD is 120mm in diameter. 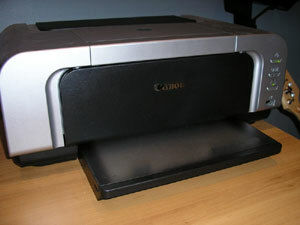 This is one of the only printers in its price range that includes support for direct printing from Canon cameras via USB. 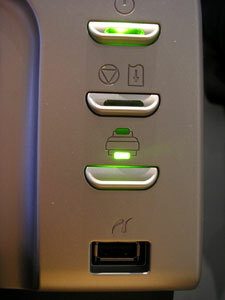 Other buttons include an On/Off switch, a paper de-jammer button (aka. the feed button) and a great feature so you can manually select the tray/feed you want to get the paper from. In this photograph I have chosen for paper to feed through the lower tray.